We are CORE – A Court Global Network. With more than 30 plants spanning five continents and a rich history of pioneering discoveries going back to 1919, we deliver solutions to meet your most demanding standards and tackle your toughest challenges. Our Global Network provides volumes of services daily. Total number of rolls processed world wide by core since 1982. To do better, join with the world's best. Five continents. Dozens of results-driven innovations. Hundreds of customers. Thousands of ideas. When you work with CORE, you collaborate with global specialists who listen carefully and then apply their tenacity and innovative thinking to solutions that will benefit your bottom line. Choose a region from the navigation above to discover more information about our plant locations. Please choose a pin on the map to learn more about a specific location or select from the following list. We aren’t just service providers, we’re partners in innovation. Need a service that’s not on the list? Interested in how a joint venture with the global leader in surface technology could benefit you? Let’s talk. Our network is your strategic advantage. With plants on five continents, CORE’s network is truly global. This brings us closer to our customers, both in terms of geography and cultural understanding, and makes our services more responsive and solutions more successful. Plants in CORE’s network are continually redefining success through benchmarking, mentoring, global and regional conferences, on-the-fly troubleshooting and cross training—collaboration that helps our customers succeed, too. Doing things better is built into CORE’s business model. Plants can develop specialized, technology-based solutions and niche products precisely because they are agile, innovative and customer focused. Our plants have aligned themselves with some of the largest steel and aluminum producers on the planet, proving that our flexible business models and niche expertise make us an attractive partner and offer solid investment opportunities. Whether you are the largest or the smallest producer in the steel, aluminum or the non-ferrous industry, CORE can help you meet your customers’ most demanding requirements. Our network spans over 5 continents. Since 1982, CORE has established successful joint ventures in culturally diverse settings around the world, giving our partners control over their own service delivery and an opportunity to profit from an investment with great growth opportunity and less business risk. We don’t talk about being the leader. Our purpose is to invent new ways of doing things. A family-based business that started in 1919 with metal finishing and through progression of chrome plating services to customers such as GM and Thompson Products we quickly refined and reinvented our technology for new industries and purposes. Today CORE is a world leader in surface technology innovation, taking our customers’ process and product challenges and investing in the R&D necessary to bring solutions to market. Early on, we developed a unique process to chrome work rolls used in steel mills, increasing roll life by three to 10 times and saving companies millions of dollars. It was a revolutionary development that helped make our name in the surface finishing industry. Today, CORE operates more than 30 chrome deposit plants in North America, Europe, Australia, Asia and South America. Another game-changing innovation is electro-discharge texturing (EDT), a process pioneered by CORE to improve the surface texture of rolls to increase their reflectivity and stamping characteristics and decrease the cost of paint application. The technology has created superior surface finishes in the automobile and white goods industries. Continuing to be at the forefront of innovation, Core has invested in the development and evaluation of technologies like EBT (Electron-Beam Texturing) and Laser Texturing as well as EDT (Electro-Discharge Texturing). We currently offer EDT at close to two dozen locations around the world. Never content with the status quo, we continue to invest in technologies to offer tomorrow’s surface technology solutions. EDT is a Prime Texturing technology that provides advanced spec of roughness including better uniformity, peaks count, and decreased waviness. But also more flexibility in regards to Ra relation to peaks and Skewness, which is Primordial for Auto, exposed part products. EDT was engineered by Core. Enhanced engineered surfaces by EDT Superfinished™, also a Core trademark are also available for improved Paintability/forming characteristic of the strip and roll life that includes free scheduling. An Advanced Texturing Technology that places Core ahead of the Leader curve recently enlarged our Texturing portfolio to meet new areas that includes low volume needs, dedicated products and still high quality requests. 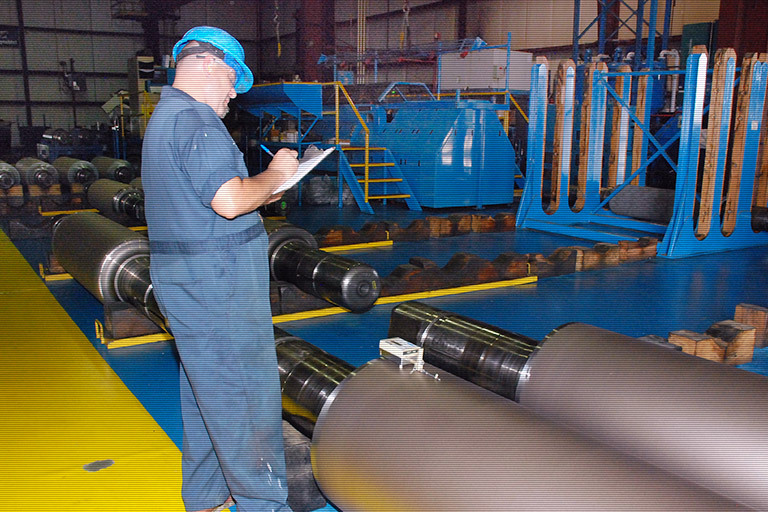 Core was the first company to offer a full roll shop solution to customers around the world. Full Service Roll Shops means driving efficiency and best practices through continuous improvement. Whether repairing damaged rolls, grinding, chocking, bearing maintenance, texturing or chrome plating, CORE remains the only supplier that can provide all of these under one roof. Instead of being simply a supplier of partial services to a plant’s internal roll shop, we do it all. Our customers benefit from our niche expertise, refined over decades, and the unmatched quality control that comes from being in charge of every step once the roll leaves the mill. Innovation isn’t just in the products and services CORE delivers, but in the way we deliver them. A joint venture gives our partners control over supply and an ability to profit in a way that’s impossible with third-party relationships. Not only does it give our partner the control they need while having the Core expertise, they also have input into operations and strategic direction of the joint venture, including outside sales. All capitalization is off the balance sheet and all profit helps offset the partner’s costs of service. The way we do our business will build yours. CORE is future-focused, whether that’s exceeding environmental standards or taking a sustainable approach to our own business practices. We’re partners for the long-term. Our “no rejects” philosophy, statistical process control, strong relationships and value added mission are the reason we’ve won dozens of awards. 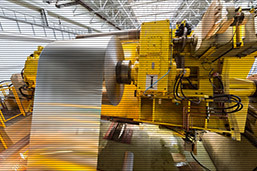 Our track record of innovation includes developing indispensable technologies for both the automotive and white goods industries, and revolutionizing work rolls in the steel and aluminum industry. Our plants are entrepreneurial “focused factories”—the best model to consistently deliver competitively-priced, high-quality, customized products to global giants. Members of the CORE network share non-proprietary cutting-edge information and offer on-demand advice ensuring creative problem-solving and concrete solutions for customers. You’ll often hear our leadership team say that we work 60% in the interest of our partners and 40% in our own interest—because, in the end, our success depends on yours. We earn our business because of the value we provide and our accountability to results, not because of the promise of favors or simply because we’ve worked with you before. CORE’s plants are small, nimble, and run relatively independently of head office, allowing us to respond quickly to your evolving needs and easily flex to local requirements and culture. Our people are the true innovators. That’s why CORE offers rewarding jobs with the power to influence the direction of the company in terms of quality, production and capital spending. It's not just what we do. It's how we do it. We meet or exceed the most rigorous environmental and safety standards. We also carefully manage our assets and make prudent financial decisions so we’ll be here to serve you for decades to come. CORE offers flexibility and fast decision-making. We can develop services for new products, adapt existing technology to new processes and even adapt our business model to meet your needs. CORE’s global plants leverage knowledge across both corporate and geographic boundaries. But each plant retains its local flavor, ensuring cultural competence and specialized expertise. Without a doubt, it’s what we do best. When you work with CORE global network, innovation, best practices, environmental stewardship and safety compliance come standard. We do not just invest in state-of-the-art equipment, we leverage our worldwide network to deliver best practice know-how and execution. Our approach is collaborative. Our services are customized. And if you become a Joint Venture Partner, you can be an owner, too. 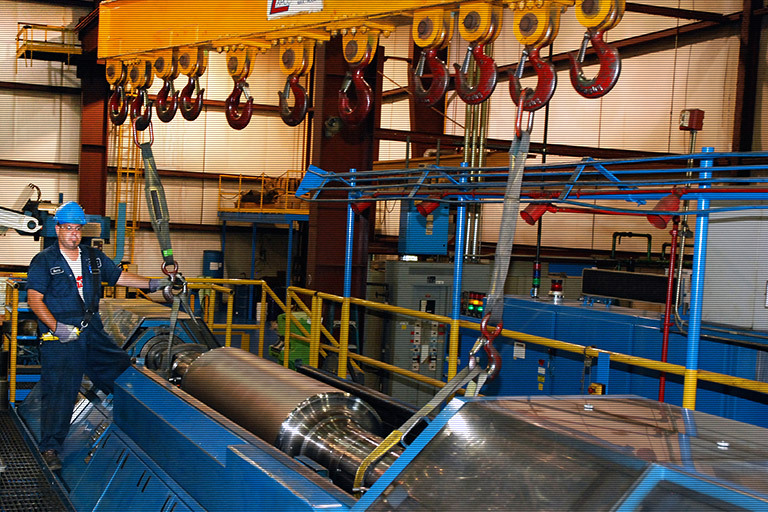 CORE was the first company to offer full roll shop services under one roof at our customers’ plants. The volume of work we do worldwide means we can easily meet your unique specs, processes and regulatory requirements. The diverse expertise of each plant in the CORE global network means we learn from the best—ourselves. It’s how we ensure top quality results and peace of mind for our customers—both today and tomorrow. CORE’s proprietary technology produces chrome deposits that are 25 per cent harder than traditional chrome plating. We apply chrome to hundreds of thousands of work rolls each year—a level of experience that is unmatched in the industry. Our environmental precautions meet the most stringent regulations, and we always apply these rigorous standards whether they’re required or not. Chrome deposit is offered onsite at cold mills as part of our full roll shop service, and offsite at one of our plants for cold mills. Others may offer texturing, but no one can match CORE’s length and breadth of experience, or our commitment to engineering the surface to meet customer needs. In terms of numbers, we texture more rolls in North America than our competitors do worldwide. In terms of surface roughness, no one can match the range of Ra that we can produce. CORE revolutionized the white goods and automotive industries with electro-discharge texturing (EDT) and has since invested significantly in research and development to meet customer needs for special requirements and unique applications. Our patented EDT Superfinish™ process takes texturing to the next level by removing the highest peaks on the EDT surface for improved homogeneity and longer roll life. Ship your rolls to a CORE plant for grinding and you’ll get the highest quality surface possible through our unique blend of superior technology and expert technicians. Using closed loop computer-controlled grinding systems we can precision-grind all shapes to spec for your industry, be it metals, paper or plastics, with a degree of accuracy that can exceed +/- 2 microns. Surface quality is ensured through low-level bruise and crack detection using eddy current, surface wave and deep sonic equipment. We can even reduce machine downtime using remote diagnostics. All technicians are highly trained on our state-of-the-art equipment, with annual courses and frequent refreshers. Knowledge sharing and troubleshooting is facilitated through the CORE global network. CORE’s skilled team understands that the only way to keep rolls out of the ‘roll hospital’ and maintain the quality that our customers demand is to understand every step of the roll shop process. We pay impeccable attention to detail when we remove the chock and bearing assemblies and replace them onto the rolls as well as taking care of the roll journals that the bearing assemblies are affixed to. This ensures that the quality of your rolls is never compromised and avoids the domino effect of damaged rolls as they move on in the manufacturing process. When an accessory or mill roll is damaged, CORE can complete the repair to original specification using the same turning, grinding, milling and welding expertise and technology that makes us a leader in the surfacing of new rolls. Come to CORE for lathing, journal repairs, straightening and weld build-up, whether you need a complete or partial repair. Best of all, we offer repair, chroming and precision grinding under one roof, providing an integrated solution for your roll requirements.